The Motorcycle Cannonball started in 2010, when founder Lonnie Isam took inspiration from his love of antique motorcycles and the riders in those early days, specifically Erwin “Cannonball” Baker. If Baker was crossing continents on a 1912 Indian, Isam reasoned, couldn’t we do it today? 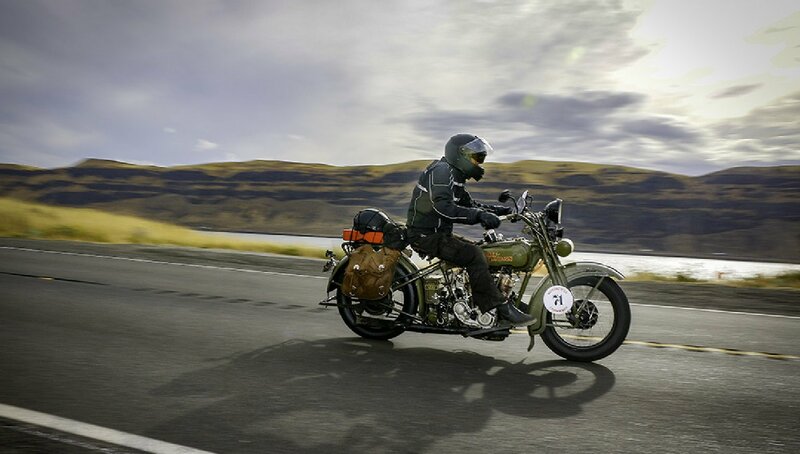 The Motorcycle Cannonball was born, running a different route across America every other year. (Considering the rarity of the bikes and parts, I’m betting riders appreciate the biannual schedule.) 2018 was the first year of the Cannonball without Isam, who passed away in 2017 after a long fight with cancer. His legacy lives on in the passion of event organizers, supporters, attendees, who put on the largest Motorcycle Cannonball to date. This time, the course wound across the northern United States from Portland, Maine, to Portland, Oregon. Jody Perewitz navigates Logan Pass on her 1926 Harley JD. AMCA photo. The Motorcycle Cannonball operates on a system of rules designed to preserve historical purity as well as safety for all riders. There’s also the competitive angle you’d expect from a Cannonball. Bikes are divided into three classes: one cylinder/one speed, more than one speed or cylinder, and multiple speeds and cylinders. Contenders must use period-correct bikes with original cases. Seeing as one racer swapped a spare engine into his bike after blowing up his main one, the rule seems to mean “no reproduction cases,” not “numbers matched or go home.” It’s a race, not a concourse. Joe Burch and Jesse Law repair a broken rod in their JDH with the last of their spare parts. They finished 61st. AMCA photo. That’s why a limited number of modifications are allowed. Fuel capacity can be upgraded, along with wheels, tires, brakes, and magnetos. Riders are also advised to carry a fire extinguisher, a “slow vehicle” orange triangle, and plenty of spares. Sweep trucks bring up the rear and assist with breakdowns, but riders try to rely on them as little as possible, since points are awarded for completed miles. Every mile you don’t ride is penalized, so it’s best to attempt a repair before trucking the bike to the next stop. Hiding from the sweep truck in the bushes is highly frowned upon. Kelly Modlin's 1927 Indian Chief nearly burned up from a gas leak, but fire extinguishers saved the bike. Incredibly, he finished the day on the Chief. AMCA photo. Cutting across the northeast, west through the Badlands, and finally conquering the Pacific northwest, the ancient bikes rolled on a carefully mapped route that avoided major highways in favor of roads that played to the machines’ abilities. Sometimes the bikes, as AMCA editor Larry Lawrence noted, “even pre-dated the highway.” Cannonballers suffered bikes up in flames, broke bones in crashes, re-attached a sprocket to a wheel with paracord and zip ties, pushed an Excelsior up Mt. Rushmore, and rode in conditions so cold and damp, racers warmed their hands with their cylinders. Finding ethanol-free gasoline was also a challenge, though a splash of Marvel Mystery oil (also period-correct) seemed to help with tankfuls of 21st century fuel. Two days before the trip's end, Pat Patterson's 1926 Harley broke a clutch rod. Zipties and this rusty roadside find kept him out of the sweep truck. Sometimes, MacGyvering like this is the only thing keeping bikes on the road. AMCA photo. Winner Dean Bordigioni aboard his single-cylinder Harley. AMCA photo. Keeping antique machines on the road is a beautiful thing, but so’s the larger implication: If they can make it from Portland to Portland, you can too. You probably won’t have a sweep truck, and your motorcycle might be a little harder to diagnose at the side of the road. You probably don't carry a spare set of valves or an extra crank, but I’m betting you’ve got more than one gear and a top speed over 45 mph! Isam knew, as these 107 Cannonballers did, that motorcycles are for riding. What’s yours for?